Enclosed transport is also commonly called Covered Transport. This is the best option for vehicles that require extra attention and protection. They also have a higher motor cargo insurance coverage than other types of transport. They come in many configurations depending on your needs and preferences. This is a premium service and drivers specially qualified for luxury, exotic, and collector vehicles. How Much Does Enclosed Transport Cost? Enclosed shipping will be more expensive than open. Roughly 30-60% more on average. To assist with helping you determine the cost, we have provided the following examples below. To find out your cost instantly, try our calculator. 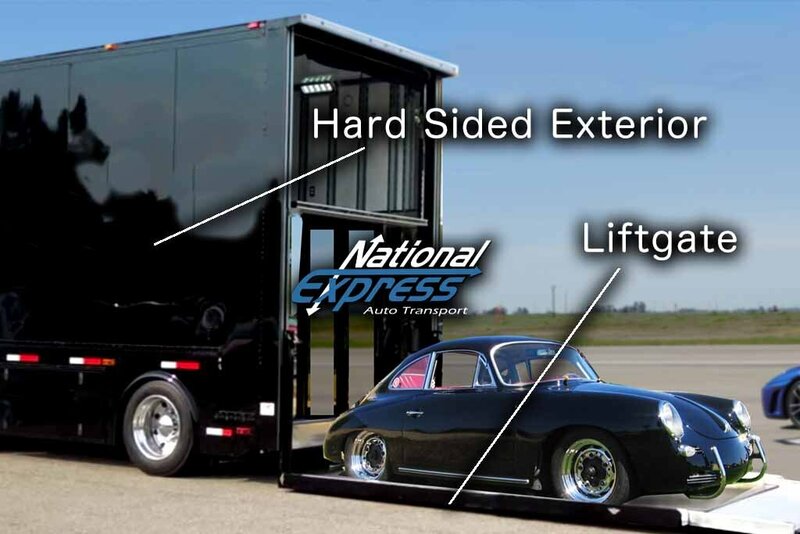 Our Enclosed carrier transport comes in 3 configurations that we will commonly use. These are soft side, hard side, and two-to-three car hard side enclosed. Soft-side enclosed trucks are the way in which most new luxury cars such as Lexus, Mercedes, and others head to sales lot. Although the tarps are tightly secured as seen here, some road dust can make its way in at highway speeds therefore slightly less appealing to the most meticulous shipper. The tarps themselves are extremely heavy and weatherproof. A large majority of enclosed shipping is done on these trucks. 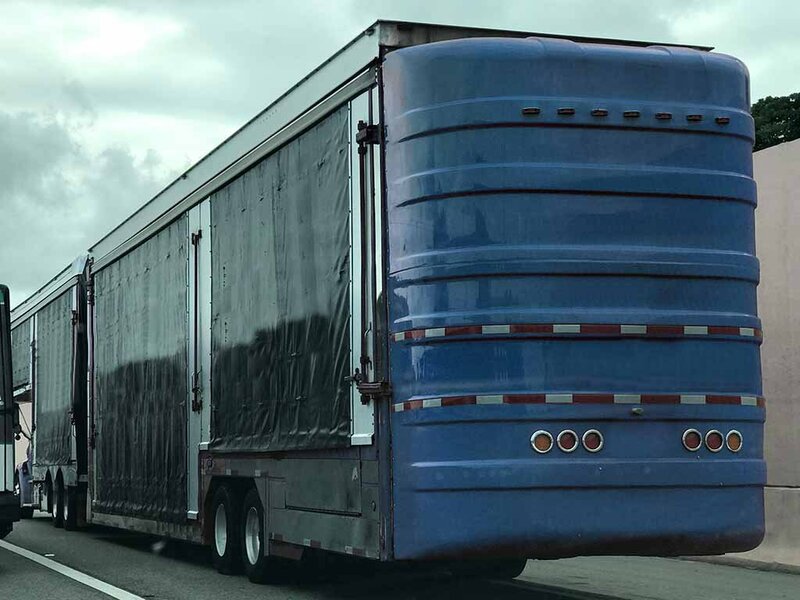 The most common you may think of is the large and full-size tractor trailer with vehicles hidden inside. They look like a regular 18 wheeler but actually move very valuable cargo like fine luxury cars, exotic cars, and expensive motorcycles. These are also called “hard side” enclosed trucks. This is actually referring to the type of trailer. This means the vehicles are sealed off from the world inside the trailer. These trucks usually have two levels. Each level holds 3 vehicles. 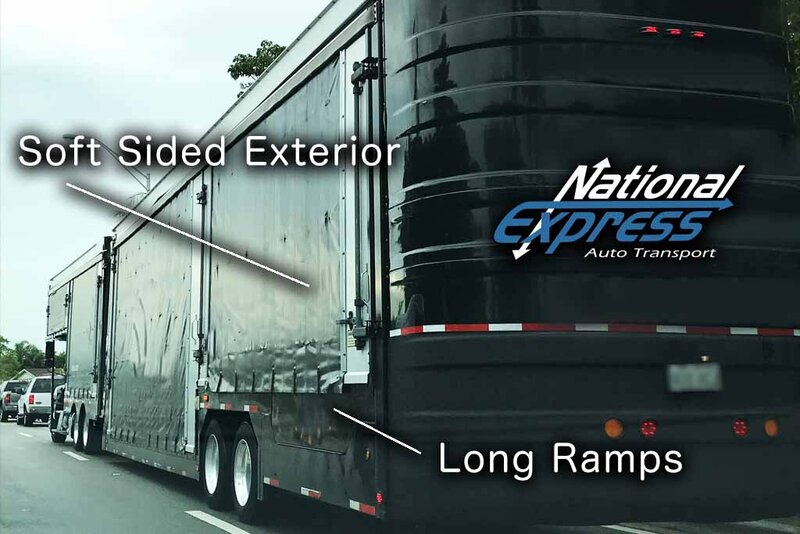 Most will have a lift-gate to safely elevate the vehicles onto a trailer that keeps them safe inside. The purpose of the lift-gate will be to prevent low clearance cars such as a race car or ultra exotic car like Lamborghini and Ferrari that can scrape as they are very low to the ground. You’ll see a lot of high-end in these big trucks. This is known as “white glove service” as it’s expected that you can touch and drag a white cotton gloved finger across the vehicle and not pick up any dust at all from the trip. For the most expensive and rare cars this is the type of carrier that you must use to ensure the best outcome. Another hard side carrier available is the 2-3 car single level carriers. 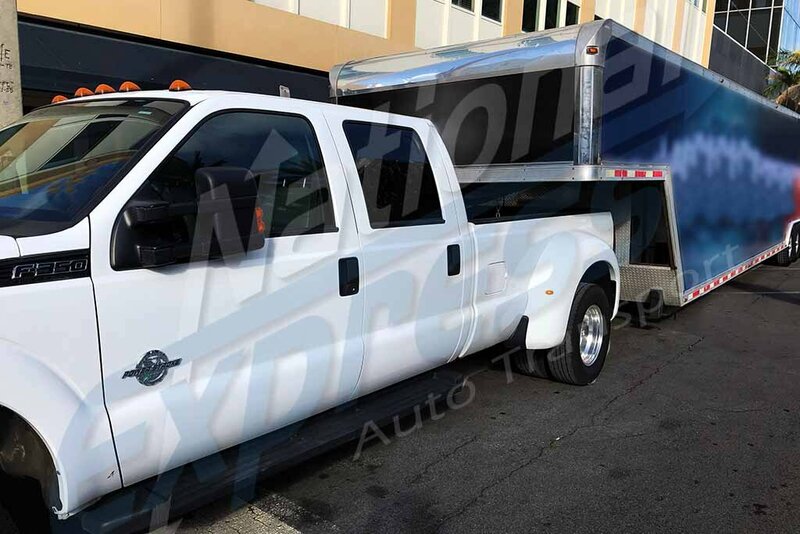 These are usually pulled by a dually truck like the one pictured here. These are great for classic vehicles, luxury sedans, and other vehicles that don’t have an ultra low clearance, although some have ramp wedges. These are also very handy for a non-running vehicle. For example, a project in the middle of restoration without glass or a top. The larger carrier may not have a way to maneuver a vehicle that has been rendered inoperable. Since they only hold two-three vehicles, they can easily get them in and out. They are popular for shorter distanced enclosed transport. Many prefer the very large carriers because their size alone makes it easy to load or offload anywhere. They do lack air ride suspension so it a a slightly rougher ride for your high end vehicle.